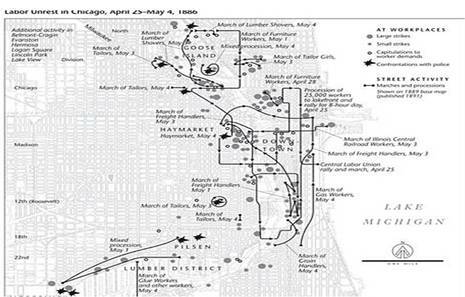 On May 1, 1886, Chicago unionists, reformers, socialists, anarchists, and ordinary workers combined to make the city the center of the national movement for an eight-hour day. 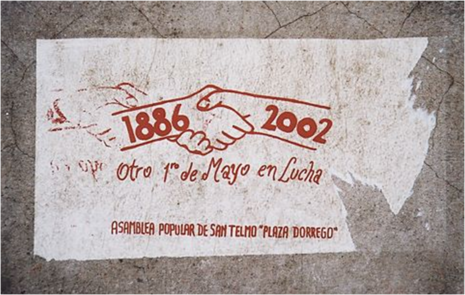 Between April 25 and May 4, workers attended scores of meetings and paraded through the streets at least 19 times. On Saturday, May 1, 35,000 workers walked off their jobs. Tens of thousands more, both skilled and unskilled, joined them on May 3 and 4. Crowds traveled from workplace to workplace urging fellow workers to strike. Many now adopted the radical demand of eight hours' work for ten hours' pay. Police clashed with strikers at least a dozen times, three with shootings. Inspired by the American movement for a shorter workday, socialists and unionists around the world began celebrating May 1, or “May Day,” as an international workers' holiday. In the twentieth century, the Soviet Union and other Communist countries officially adopted it. The Haymarket tragedy is remembered throughout the world in speeches, murals, and monuments. American observance was strongest in the decade before World War I. During the Cold War, many Americans saw May Day as a Communist holiday, and President Eisenhower proclaimed May 1 as “Loyalty Day” in 1955. Interest in Haymarket revived somewhat in the 1980s. The Haymarket affair is generally considered to have been an important influence on the origin of international May Day observances for workers. In popular literature, this event inspired the caricature of "a bomb-throwing anarchist." The causes of the incident are still controversial, although deeply polarized attitudes separating business and working class people in late 19th century Chicago are generally acknowledged as having precipitated the tragedy and its aftermath. The site of the incident was designated as a Chicago Landmark on March 25, 1992. 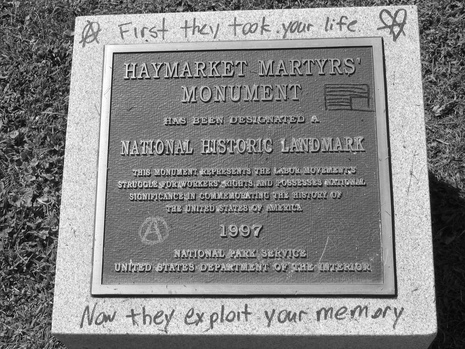 The Haymarket Martyrs' Monument in nearby Forest Park was listed on the National Register of Historic Places and as a National Historic Landmark on February 18, 1997.